Is it time to replace your morning cup of coffee? Made from the leaves of the South American rainforest holly tree, yerba mate has been celebrated for centuries due to its high nutritional content and numerous health benefits. It is no secret that tea makes an excellent addition to a healthy lifestyle, and yerba mate tea is no exception as its advantages range from boosting the immune system and promoting cardiovascular health to strengthening bones and even preventing certain types of cancer. With 90% more antioxidants than green tea and an abundance of vitamins and minerals, yerba mate is a delicious way to jump-start your day by positively transforming your body from the inside out. Yerba mate tea works in a unique way to boost your energy and mood. The vitamins, minerals, and antioxidants combined with a caffeine content that lies somewhere between that of green tea and coffee help to keep you functioning at full capacity and work to eliminate fatigue. Unlike coffee, yerba mate provides smooth, balanced energy and increases feelings of alertness and wakefulness without those dreaded caffeine crashes, jitters, or shakes. Additionally, sipping yerba mate tea can improve mental clarity and function, boost short-term memory, and even reduce stress. Because of the gentle, subtle nature of these stimulant properties, yerba mate does not interfere with sleep, making it an excellent alternative to other stimulating beverages such as coffee and energy drinks. Yerba mate also boasts the ability to help its users maintain a healthy weight by reducing your appetite and causing thermogenesis, which helps increase the number of calories you burn during exercise. By increasing physical endurance and boosting your body’s ability to metabolize fatty acids and carbohydrates more efficiently, yerba mate can help you prolong your workout time and help your body get more energy from the food you eat. It also delays the buildup of lactic acid in your muscles, preventing you from experiencing post-workout pain, meaning you can exercise more frequently and for longer periods of time allowing you to burn more fat. 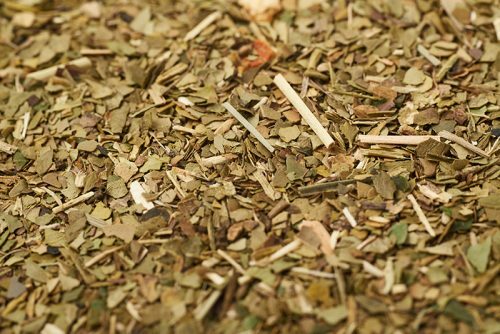 As an added bonus, consuming yerba mate tea helps improve digestive function by softening stool and encouraging regular bowel movements, and is a powerful treatment for issues such as indigestion, diarrhea, and constipation. While you may prefer to enjoy your coffee in the form of a flavored latte, consuming all that extra sugar can counteract the hard work you put into your diet or your exercise routine. Fortunately, yerba mate can be enjoyed without any additional flavoring, making it an advantageous choice for anyone trying to maintain a healthy weight. Because proper nutrition plays such an important role in the appearance of skin and hair, it may come as no surprise that yerba mate tea can facilitate improvement in this area. Yerba mate tea can be used both internally and externally to promote beauty. By drinking this powerful tea regularly, you can add luster and shine to dry, damaged hair. It also functions as a powerful tool that fights against hair loss, and it even stimulates new growth. The high content of antioxidants provides a solution for signs of aging as they work effectively to prevent free radicals from damaging your skin and hair. When applied topically, yerba mate extract can significantly reduce the appearance of stretch marks and cellulite.